MacRumors has learned that a high-level executive at Barclays, one of the largest banks in the United Kingdom, anticipates "imminent" support of Apple Pay in the country. Apple Pay in the U.K. is expected to go live on Tuesday, although it remains unclear if Barclays will be a first wave launch partner because of its delayed negotiations with Apple about the mobile payments service. Apple confirmed at WWDC last month that Apple Pay will be available in the U.K. in July, but stopped short of providing a specific launch date. Recently released employee training documents have suggested the launch could come next week, on July 14, and some Santander customers were able to add their cards to Passbook for use with Apple Pay and make purchases ahead of that date. 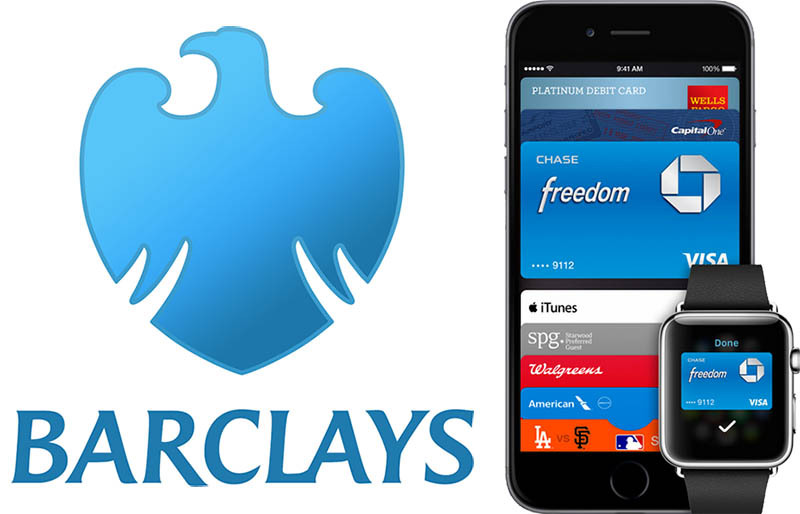 Barclays was notably absent from Apple's list of banks that will support Apple Pay in the U.K. at launch or soon after, which presently includes HSBC, Lloyds Bank, Bank of Scotland, Royal Bank of Scotland, First Direct, Halifax, M&S Bank, MBNA, NatWest, Nationwide, Santander, TSB and Ulster Bank. The bank's subsidiary Barclaycard has offered an Apple Rewards Visa Card for several years. Barclaycard recently expanded its "bPay" lineup of wearable solutions for contactless payments to include a wristband, key fob and sticker, leading to speculation that Barclays may be electing to use its own mobile payments services as opposed to Apple Pay, similar to how some retailers maintained exclusivity to the CurrentC platform last year. Today's confirmation, however, indicates otherwise. I can't stop staring at the Barclays ligature ('https://en.wikipedia.org/wiki/Typographic_ligature'). It's… perplexing. I filled an official complaint form in about their lack of support for apple pay, I had a phone call within 2 hours from Barclays explaining the situation. I laughed at how much abuse they were getting on Twitter not supporting it. I'm guessing the amount of complaints / comments being made has made them change their mind. I'm giving them until Christmas to support it or I'm off to somebody else . Hi. What Swiss-G said is correct. The merchant's bank is irrelevant. All that is needed is that YOUR Credit Card's issuing bank has made a deal with Apple and has the ability to detokenize the DAN (Device Account Number) into your PAN (Primary Account Number) which is the one on your real card. Thereafter, when you tap to pay, your device sends the DAN token and the OD-CVM (On Device Cardholder Verification Method) flag via NFC comms to the Merchant's Terminal. If the terminal is updated, it can recognize the OD-CVM flag and bypass the usual contactless PIN / signature limits. Note that this standardized flag can be used by any payment method, not just Apple Pay. If the terminal is not updated, then the limits still apply. The approval then runs the reverse course back down to the merchant terminal and your device. At the end of each day, the Merchant Acquirer service totals up sales - refunds, and requests each card Issuer Bank to deposit that much money (minus the Acquirer's and Brand's fees) into the Merchant's Bank, which can be any bank. The Credit Card Brand (Master /Visa /Amex) is responsible for sending a cut of the fees that normally go to the bank, to Apple. So how does apple pay actually work? So why are Apple having to get retailers to opt-in to Apple Pay, if that's the case? This was my original understanding of how Apple Pay would work (anywhere where contactless payments was accepted) but then I heard this was something that retailers specifically had to accept and that some would be blocking it? They don't need to, it's all marketing. Any retailer that has rolled out contactless terminals can take apple pay, but to highlight the service Apple have selected so called partners to help advertise the service. If they didn't it would just be another payment service amongst the crowd for most people. Remember, most people are not clued up on the security benefits and are sceptical about new payment systems. By highlighting big companies that have rolled out contactless to all their terminals Apple is hijacking the contactless roll-out success and associating it with Apple Pay. This will hopefully create some adoption impetus outside of natural (us lot) early adopters. I'd been with Barclays for about 20 years. Switched my account to First Direct when I heard they weren't going to support Apple pay at launch. Got to say I miss Barclays online banking though, they did it very well. Their iOS banking apps were also very good. May consider switching back if they support Apple Pay. Come on Barclays! Sort it out and win back your customers! Now you're with First Direct, you will begin to realise quite how **** all the other companies you deal with are, when it comes to customer service. I've been with FD since the day they launched and would never ever consider switching to another back. Good. Soon they can stop complaining. The Barclays one predates this usage of the German eagle by over 200 years.